After choosing to use direct or indirect solar geyser system, it must be decided whether the configuration is going to be active, passive, split and / close coupled. Close coupled water heater systems are so called, because the collectors for the solar geyser system and the solar geyser storage tank are close together. The solar geyser storage tank is mounted directly above the collectors of the solar geyser system and these are most commonly installed on a roof. The hot water from the collectors rises by thermosyphon flow through the very short connecting pipes into the solar geyser storage tank and as a result it’s also referred to as a ‘Thermosyphon Solar Heated Water System’. These solar water heater systems are passive systems as the water or heating fluid is not actively circulated (pumped) around the solar water heater system. The fact that the collector and storage tank in the solar geyser system are close together means that there is less heat loss in the pipe work connecting the two. Installation is reasonably straightforward and therefore it is more likely to be installed correctly. No difficult roof flashing has to be undertaken. The entry of the cold water supply, and the hot water delivery pipes and the electric power cable is fairly simple. There is no scrambling in restricted ceiling spaces. The installation is out in the open. 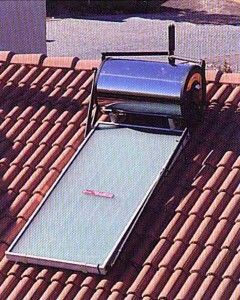 The solar geyser system can be installed on houses with flat roofs, where there is no ceiling space at all. Giving a quotation is reasonably straight forward. A leak should not result in water running through the ceiling. One doesn’t have to open up the roof when replacing a solar geyser storage tank. No drip tray is required under the solar geyser storage tank. The system still operates during power outages. No circulation pump is needed, which reduces the cost and removes a mechanical component, which could possibly fail and prevent the system from working. The wide, low solar geyser storage tank has poor stratification and heat is conducted down from the hot water to the cold water beneath it. The roof has to be strong enough to support the weight of the water in the solar geyser storage tank. Additional strengthening isn’t always possible when the roof is not strong enough. Some people find the solar geyser tank on the roof aesthetically unattractive. The solar geyser storage tank and particularly the double jacket heat exchange unit, is heavy. Getting it on to the roof, especially a steep one, can be very difficult without lifting equipment. Extra safety equipment might be required, adding to installation cost. If the roof on which the close coupled unit is to be mounted does not face the sun (north in the southern hemisphere), a support frame is required. This is often aesthetically displeasing and is usually expensive. The support frame, in turn, requires significant support through the roof to the building frame. Protection of all exposed pipes prone to possible freezing is required. A variation of the close couple thermosyphon solar water heater system is when HWC is moved into the roof space under the roof cladding. This is known as “split thermosyphon system”. The storage tank must still be above the collectors (a minimum of 300mm) and usually one will have to position the collectors of the solar geyser sytem as low as possible on the roof and construct a timber frame on which to stand raised solar HWC storage inside the roof space.